Zimbabwe’s 92-year-old President Robert Mugabe should run “as a corpse” in next year’s election if he dies before the vote, his wife said Friday. Grace Mugabe accused some ruling ZANU-PF party officials of plotting to take over from her husband and said that even if he dies, supporters should put his name on the ballot to show their love for him. “If God decides to take him, then we would rather field him as a corpse,” she told thousands of cheering supporters at a rally in Buhera in eastern Zimbabwe. She spoke in the local Shona language. The president, who will turn 93 on Tuesday, has slowed down on public engagements while his 51-year-old wife has become increasingly visible in politics. Mugabe has been in power since white minority rule ended in Zimbabwe in 1980 after years of war. A big celebration for him is planned on Feb. 25, a few days after his birthday. Grace Mugabe warned associates of Mugabe from the era of guerrilla war against white rule that they can’t take power because they also are old. “Anyone who was with Mugabe in 1980 has no right to tell him he is old. If you want Mugabe to go, then you leave together. You also have to leave. Then we take over because we were not there in 1980,” she said, pointing to herself. 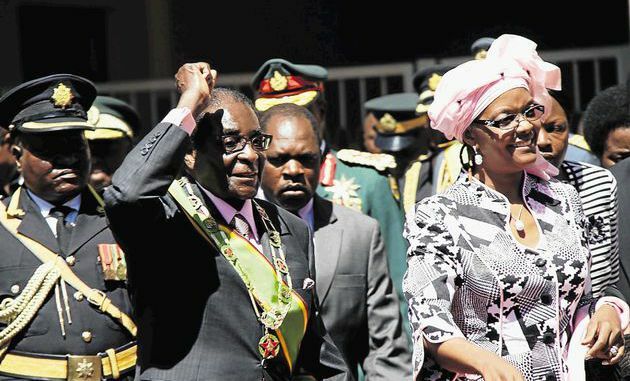 Grace Mugabe has professed fierce loyalty to her husband, previously saying she would get him a wheelchair if necessary and push it for him so that he can continue to rule. Mugabe has declared he wants to live until 100 and rule for life, and has complained about ruling party factions that are jostling for influence as a succession battle looms.